Dr.Atia, who is currently President of Orbital Communications International, responsible for the communications business area under Orbital Science Corporation, was interviewed for Space Japan Review. "We were fortunate that the slow down in the GEO satellites orders did not have any significant adverse effect on our plans, perhaps partly because our targets are modest, and also because the smaller satellites are more appealing to operators in a down market. So the results for Orbital business is as expected. " Dr. Tadahiro Sekimoto, Chairman of the Institute for International Socio-Economic Studies (IISE), who was formerly Chairman of NEC Corporation, was bestowed the highest Medal of Honor from IEEE. The Honors Ceremony was held in Kansas City, Mo. in the U. S. on June 19. The citation for the award is the �gpioneering contributions to digital satellite communications, promotion of information technology R&D, and corporate leadership in computers and communications.�h The medal is comparable to a Nobel Prize in the information communications field. 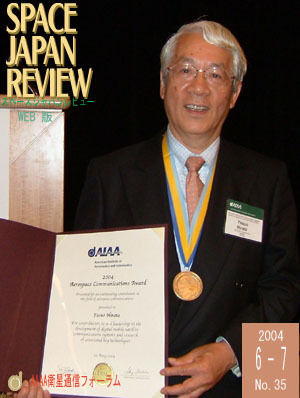 Dr. Sekimoto was also the first chairman of the AIAA Japan Forum. "Can We Understand Wind ?" What changes have emerged in the world since the beginning of the 21st century? We should recognize the changing role of the national research organization. Manned space development is the most suitable choice of our country. Are there still reservations to start manned space development? Manned space development does not obstruct R&D of satellite communications. Indeed, most engineers and scientists working today in the space field have come into the field after being educated in completely different areas of engineering, science, or mathematics. Fortunately, most who undergo this kind of on-job training in space engineering survive the ordeal, and the accomplishments that have been achieved in the past fifty years in exploring and utilizing space attest to the excellence, expertise, and dedication of those working in the field. Nevertheless, one can only conclude that there must be a better way to develop tomorrow's space engineers and project managers.